Its time to finish up our 3rd piece of furniture in this series! I can say without a doubt this one has been my favorite! After all pink is my favorite color so it really was no contest. 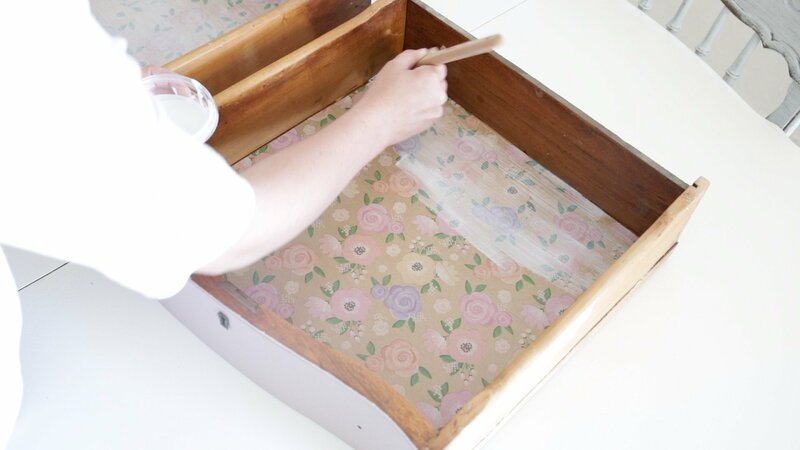 Today I am going to show you how to?line furniture drawers with wrapping paper. **Please note this post contains affiliate links. 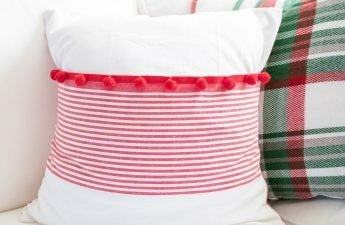 You may want to line furniture drawers with wrapping paper for a couple reasons. 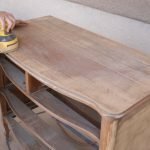 The first reason is if you are working with a really old piece of furniture and the drawers need some help. 90% of the furniture in my home is second hand found on craigslist. If you know anything about second hand furniture you know that often times the drawers are a little beat up inside. 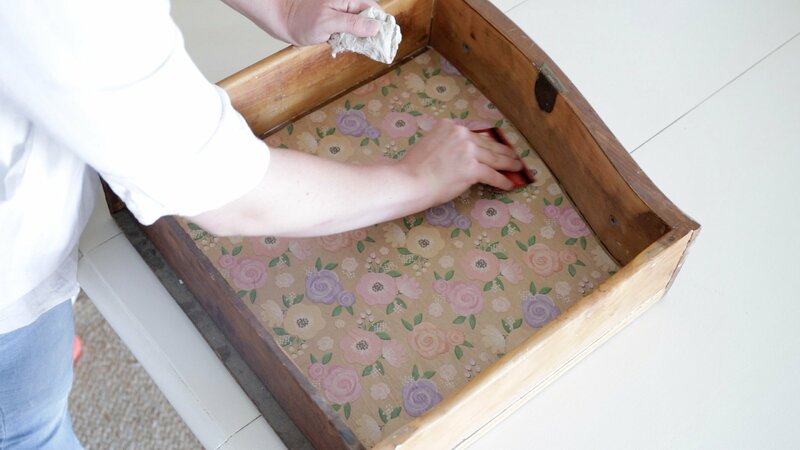 You can easily line furniture drawers with wrapping paper and they are now a much cleaner and beautiful surface. Making you much more delighted to store you belongings inside! 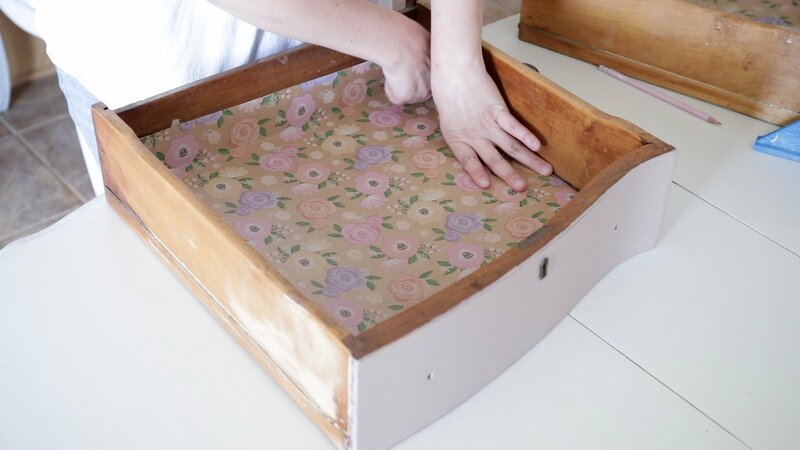 A second reason you may want to line your furniture drawers with wrapping paper is to protect the actual drawers. 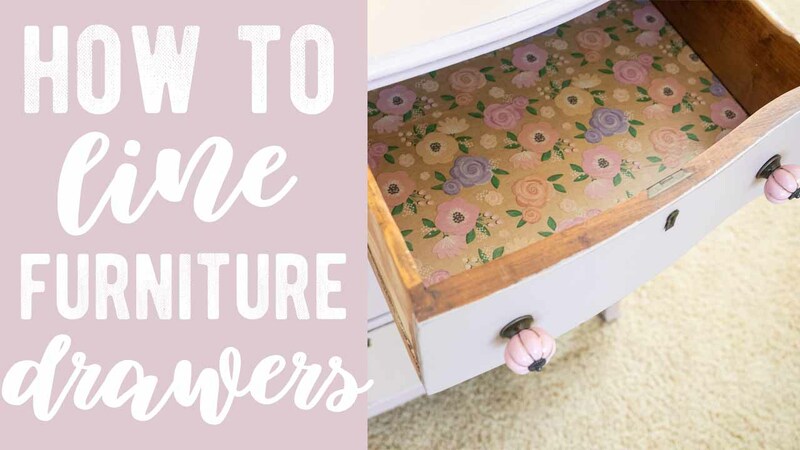 With this method of I am about to share with you, how to line your furniture drawers with wrapping paper, you will completely seal the bottom. This makes for a very durable surface. The last reason you may want to line furniture drawers with wrapping paper is to make them cute! I have to say my main motivation was this one. But regardless it also adds as a layer of protection over time from wear and tare too. I call that a win win. 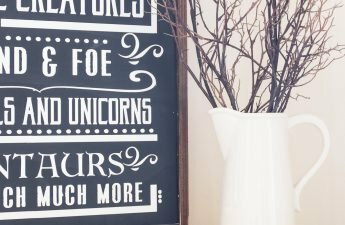 If you are in the business of flipping furniture to sell this may be a great way to stand out. There are lots of people now flipping furniture to sell. By this I just mean, buying furniture and making it over by refinishing or painting and then selling it for a profit. If this is your motivation having cute lined drawers may bring in buyers faster! 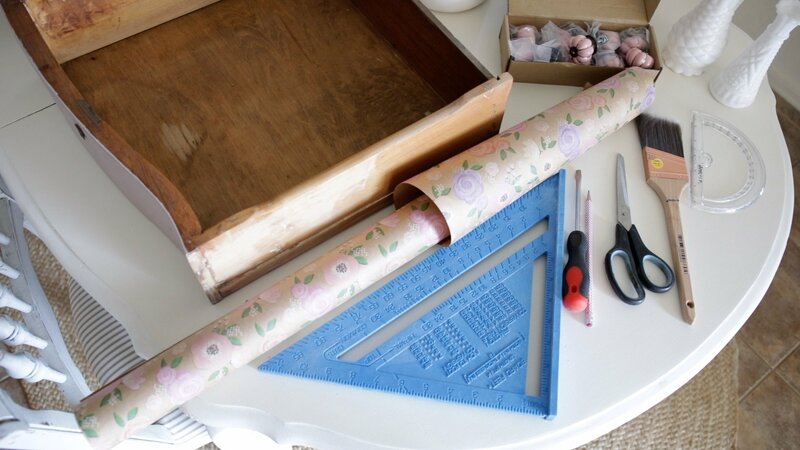 Wrapping paper is a very cheap alternative to contact paper or even the foam/rubber drawer liners. This method will also stay in place meaning your not going to be fighting the paper in the bottom. 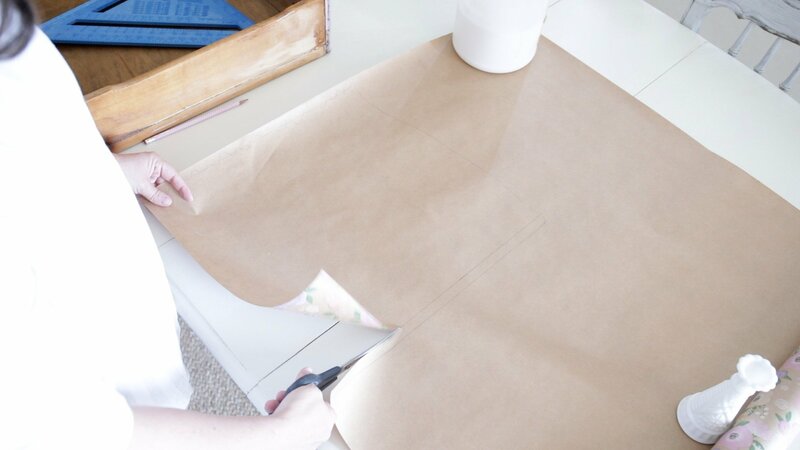 First roll out your wrapping paper on a flat surface. Using paper weights of some sort to keep the paper from rolling all over. You’ll thank yourself in a second for doing this! 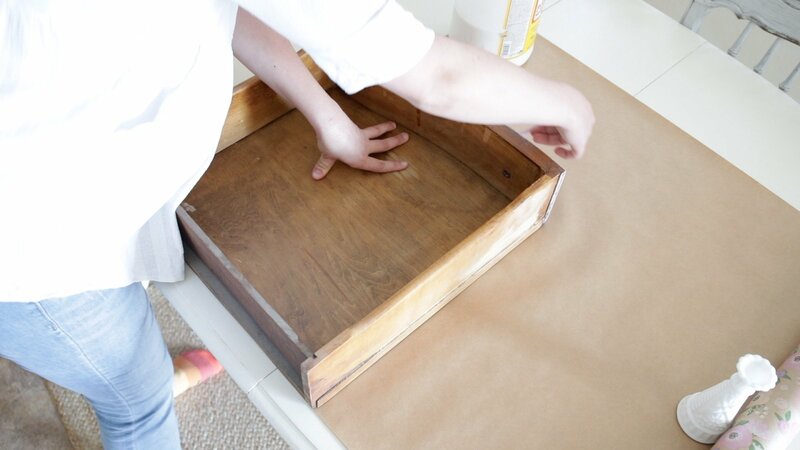 Put Your drawer on top of your rolled out paper and push it all the way to the edge. This will just mean you waste less paper and have enough! Maybe even a little left over for some actual present wrapping. Trace with your pencil all around your drawer. I like to trace the bottom of the paper not the side you will ultimately see. If you do this make sure that if you have curved drawers like mine are that you mirror the sides if they are not a standard square. Mine curve into the center of my dresser meaning that the template I cut for the right side will actually fit the left side once I flip it over, and vice versa. If you watch my video I explain this and show you in exact detail. Once you have traced the initial size of the drawer, measure the width of the drawer sides.Remember the liner should fit perfectly inside the drawer so you’ll need to size down your first tracing. Don’t worry about the front or back just yet. 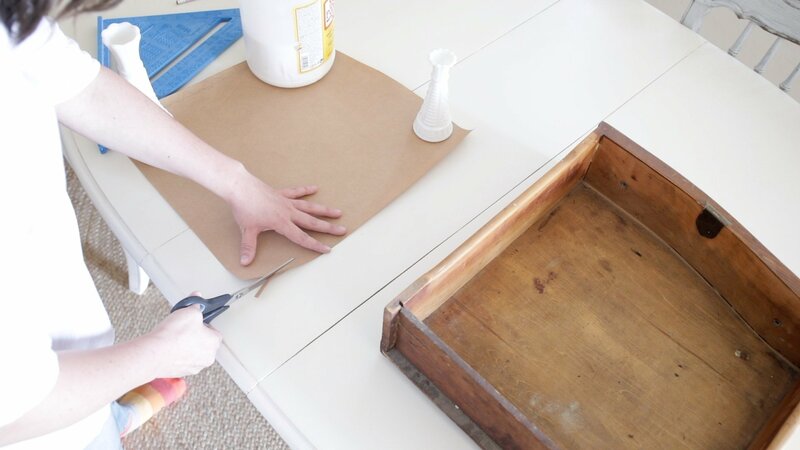 Using your scissors trim out your template, then place it inside the drawer. Checking to see if it fits. it will be too long but just lightly make an impression along the back where you need to cut by folding it to the right size. 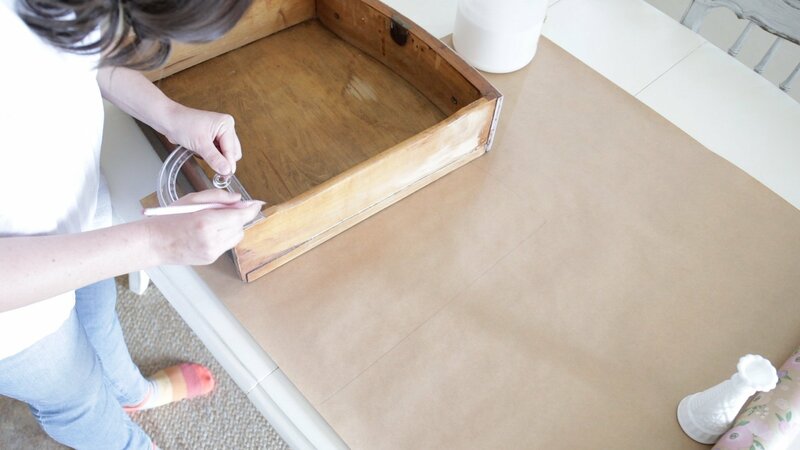 Trim off all the excess needed for your template to fit exactly in the drawer! and double check the size once again. You DO NOT want any of the paper to be bending up because its too big. if anything cut it a little smaller. This will cause it too look un appealing and even wear off over time once you glue it in. 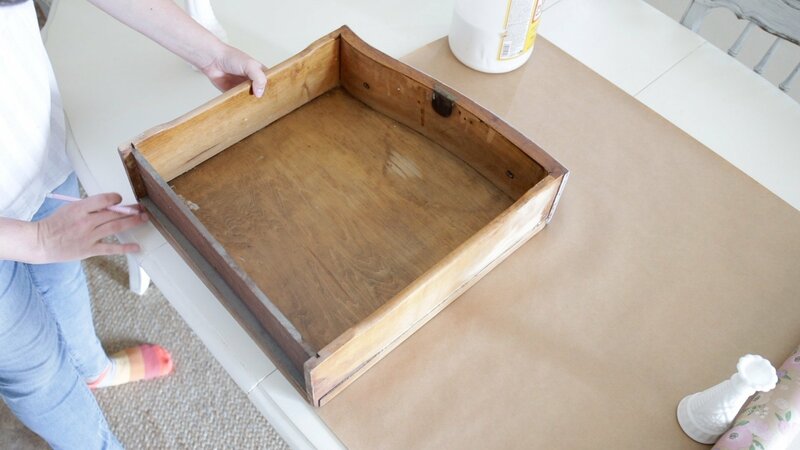 Pour a generous amount of Mod Podge in to the bottom of your drawer. You may want a drop cloth below your drawer incase it drips out underneath. 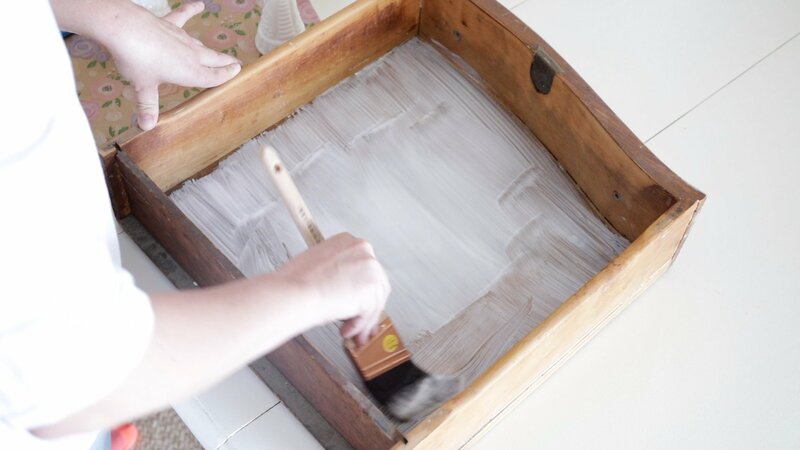 Using your paint brush, brush it all over the bottom of your drawer. You want it completely covered. I learned the hard way that not using enough glue means it wrinkles up once you put the top coat on later. So don’t hesitate about using a good amount. Also if you get a little on the sides it will dry clear so its not a big deal. place your wrapping paper right side up into the drawer onto the glue. Press down with your hands and fingers the best you can. Then using an old credit card press from center to the sides eliminating all the wrinkles and bubbles. The glue will get squeezed out of the edges when you do this so be sure you have your damp rag on hand to wipe up the excess. This step is tedious and will take some time and patience. Mine wasn’t absolutely wrinkle free but It still looked good in the end. Be careful not to press too hard or catch the corner of your credit card on the paper and tare it. 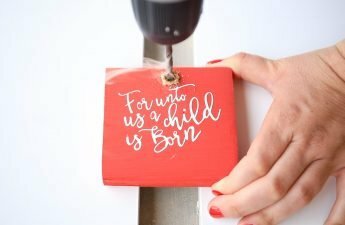 But if you do ( I did ) you can just cut out a little piece of paper and glue right over the tare or hole. Set aside and let dry completely it shouldn’t be cold to the touch anymore once it is dry. During this time repeat the steps in the process for the remaining drawers. 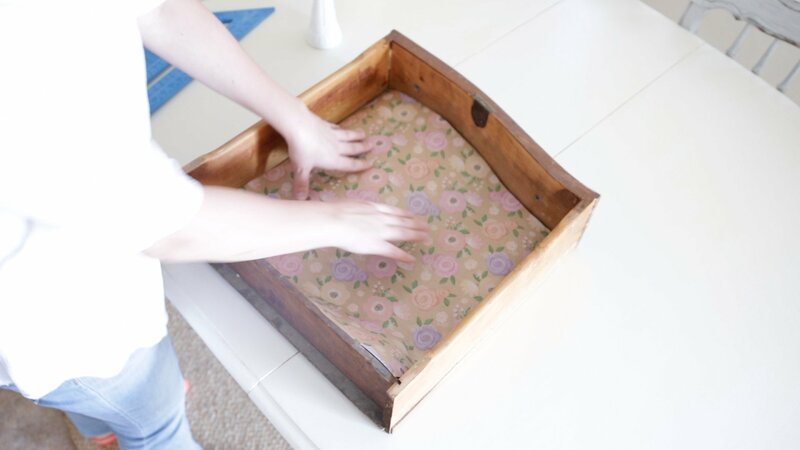 Once the drawers are lined and dry you can finish them off by applying an additional layer of mode podge to the tops of the wrapping paper. I only did one generous coat but you may want to do a few for more durability. Let dry for a few hours and you’re done!! I have a love hate relationship with the knobs of this dresser. 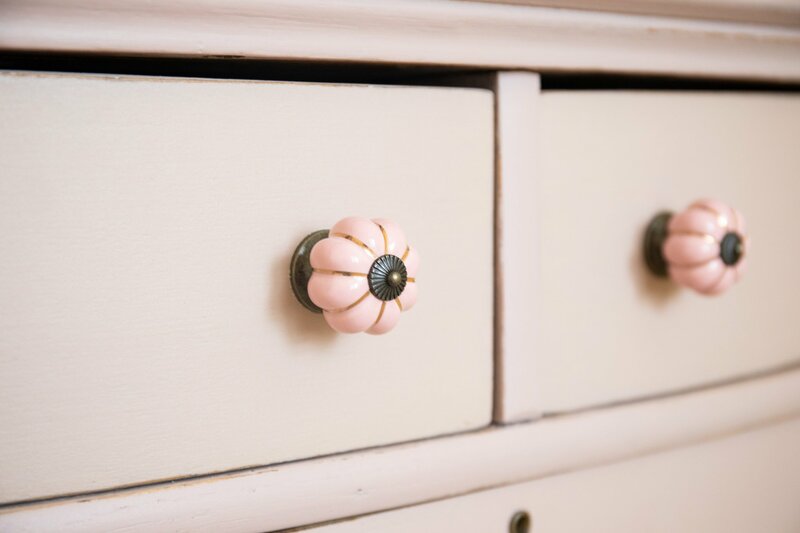 I loved how cute they were and that they were the perfect shade of pink and that the knobs themselves were made so well. However, I hated how they fastened on to the dresser and that the hardware they came with was not even close to being long enough to work on any standard drawer. I had to hunt down the right screws and still had to settle for a size that barely screwed in. It took some convicing for the screw to go in. I then had to stack a bunch of washers on the back to get them to be tight and not loosely in place since they fastened on so weird. You can decide to pick this battle if you think they are cute enough I am already invested and would have to say it was worth the trouble but I would avoid knobs made like this in the future. 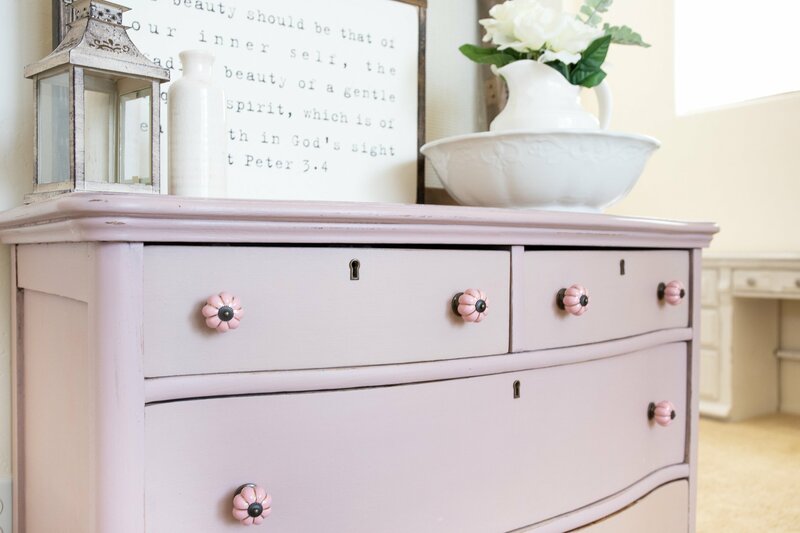 If you loved this dresser as much as I did you can follow all the steps in this post and the 3 before it to achieve this exact look. It is literally fool proof! I also will mention again the color of the dresser is Arabesque from Miss Mustard Seeds Milk Paint line. I was so impressed with the color and coverage that came from this pink! 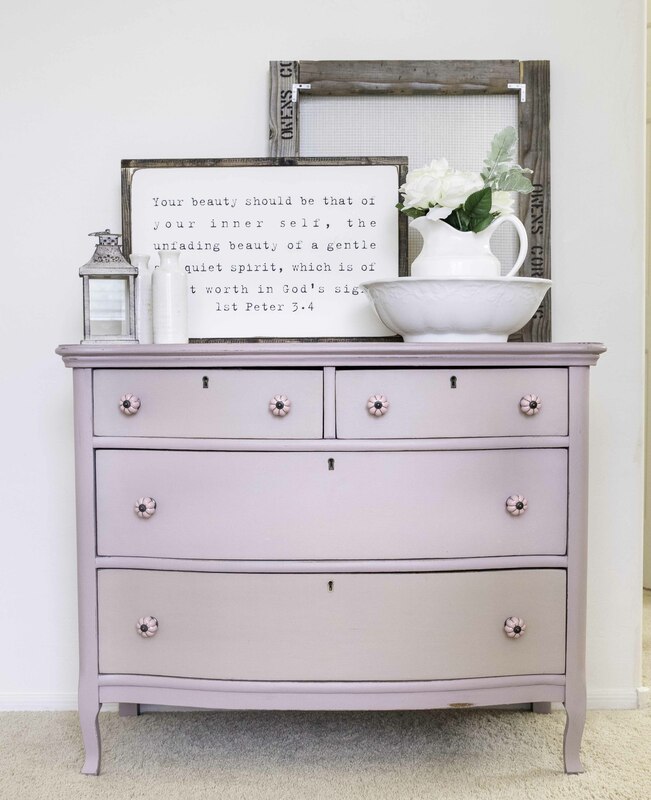 I’ll be painting one more dresser for my girls and have decided to go with it again I loved it so much. I am still working through a few more pieces of furniture next week we will start a new project with a line of paint I have been fascinated by for a long time! I can’t wait to share it with you! I have really enjoyed watching your milk painting videos. They have helped me so much, you answer my questions just when I want to ask them. I also follow your instagram and adore your photos. That is my question, what kind of camera do you use for your posts? What settings do you use to enhance your photos? Thanks so much for sharing all your knowledge! As far as editing goes I use Lightroom its a really user friendly software if your unfamiliar and for that Beth at unskinny boppy has a full course! that taught me a thing or two even after several years using it! 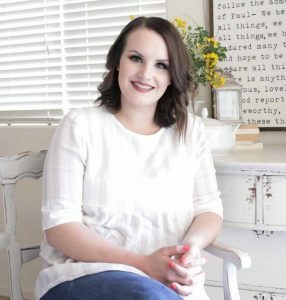 https://unskinnyboppy.com/see-all-photography-tutorials/ between these two ladies and their wealth of knowledge you will find countless ways to start and then improve your photography! I sure hope these resources help!